You can always do more for your clients… Maybe you could hire more people to serve them, right? But, do you really want to keep hiring new people as you get new clients? Or would you rather improve the workflows and effectiveness of your existing team, so you can serve more clients, get more value for them, without stressing your team beyond breaking-point? Scheduling apps for Social mostly focus on scheduling a SINGLE post at a specific time in future, mostly aimed at getting Likes, Shares, Comments. Or, it can be that same URL shared multiple times, with the same Title, Description, Image. Aimed mostly at creating duplicate content on social walls. Yes, it is important to have social engagement… but it’s even better if you can provide your client with a steady flow of social TRAFFIC to their website. And it would be great if you can achieve this for every single client, for every single blog post from their website, with any one of your employees, in under 5 minutes per campaign. And wouldn’t it be great if, from one blog, you could automatically create unique social posts so that you can avoid repetitive titles, images, and descriptions hitting clients’ pages and accounts? What if you could schedule posts way out in time, and then over time, see the analytics from multiple social platforms at once, in one place. Running an effective social media marketing team, and doing effective social media marketing campaigns for your clients should revolve around the client’s website, where each blog post can be scaled up to a full-blown social media marketing campaign, but with minimal manual work involvement. The way to achieve this is to use the right tool for building those social updates, to measure their emotional impact, and to schedule them easily for a week, a month, or even a year. From One Dashboard: Manage All Your Clients, All Your Staff, All Their Activities, With A Few Clicks On Your Mouse, In A Few Minutes Per Day. So far, most of the social scheduling apps will take hours, even days to put together proper social marketing campaigns. This is why we’ve built Populizr for Agencies. It’s a one-stop-shop for Client Management, Team Management, Social Post Creation, Social Campaign Scheduler, and Social Analytics. Populizr’s Sentiment & Emotions Analyzer helps you hit the right emotional buttons with your audience so you can fine-tune each social update before you create the campaign. Populizr creates unique variations of every single blog title/meta description/images so you can avoid duplicate content. Track every click, on every social post, nicely mapped on the world map, so you know where your visitors are coming from. Easily Manage Multiple Accounts From A Single Dashboard. An easy-to-use interface so you can serve more clients with the same staff faster than before, and offer more value to all of them. Simplify Onboarding Of New Clients. 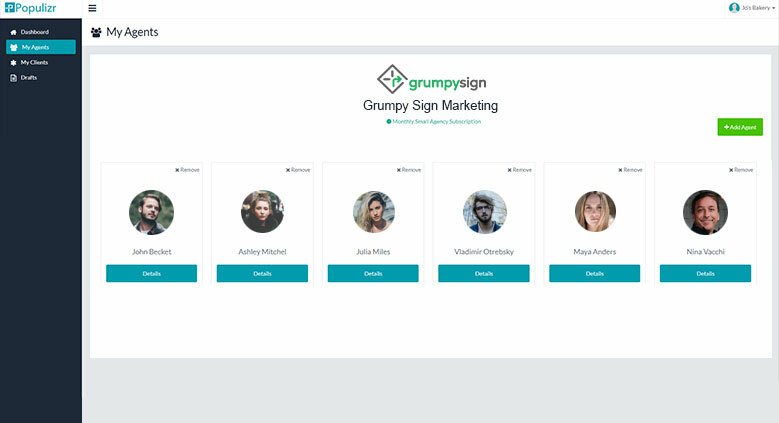 Clients can connect their own company social profiles without having to assign you as an Admin on their Pages. Make Sure Clients Always Pay. By only one click you can pause and reactivate your social activities so you only serve to paying clients. Easily Track Employee Activities Of Scheduled/Edited Campaigns. As an Agency owner, you can easily assign an Agent to a Client, and track the progress of each campaign. With Populizr for Agencies, you can simplify and strengthen how you manage your clients and your Social staff, all from one Dashboard. Populizr helps you deliver greater value to your clients, with less work from your team. The entire Social Media Marketing industry is thinking of simple metrics to measure successful marketing campaigns. But nobody ever paid their electricity bill with a bunch of Likes, Shares or Comments. Clients need social TRAFFIC to their landing pages and blog posts. With over 2 Billion searches DAILY, Facebook Search is the giant traffic marketers should tap into by having a very strong focus on Social SEO. Factor-in other social networks like LinkedIn, Twitter, Pinterest, and the Social Universe becomes the second largest search-traffic source after Google. Yet, nobody really talks about this as a key traffic source. Even fewer agencies have this as part of their strategies for doing Social Media Marketing. Populizr is built at its core as a Social SEO Automation Platform that gets your team on board with how a social campaign should look like. Train your team to easily and quickly evaluate and tweak of the Sentiment and Emotions Map of texts. Rehash top-performing campaigns as Evergreen campaigns. Learn from the best performers, and tweak existing campaigns to improve their effectiveness in driving social traffic to the client’s site. Have a simple way to track Agent activity. Populizr for Agencies helps you do all these things. Educate your client that an effective social media marketing campaign is the one that gets a steady, ongoing, lasting flow of social traffic to your website. Don’t bother with a simple count of likes, shares, comments. Those have an insufficient effect. Instead, educate your clients of Social SEO and Social Search. Profile is each user account that can have 5 social networks connected (with multiple pages, groups, boards). Unique feature for businesses and agencies. Each agent/moderator can manage multiple clients.